I am a Qualified Builder and a Licensed Building Practitioner, which keeps me up to date with building industry regulations and the latest developments. I have now had more than 10 years experience doing Pre Purchase House Inspections and have completed over 2000 Building Reports. You may already be knowing the different types of increasing pollution levels around yourselves but everyone considers their home as a place that provides warmth and brings chill, but what if, I tell you that’s not totally correct as the house may be contaminated with Meth, indeed it sounds shocking but this is what the test results found very common among the houses in New Zealand, and hence it becomes a threat to the whole families health. Meth or methamphetamine is a class A drug that directly targets central nervous system and is manufactured chemically, these are very common and cheap also meth has many serious effects on health whether you are directly smoking meth or you are getting it indirectly into your body system. These days Meth testing is term getting common in Auckland, this service specifically provides exclusive features of testing the meth contents in your house that may be collected and present at some places in the house due to smoking or preparing of meth done by the early tenants or previous owners, meth actually possess tendency of sticking to the walls and other parts of the house and are non-removable easily. The meth contaminated house is generally a place of great danger and will bring serious health issues to the life. Auckland has many service providers that do the meth testing for the contamination at affordable prices and if the test results go positive you can also opt for purification. 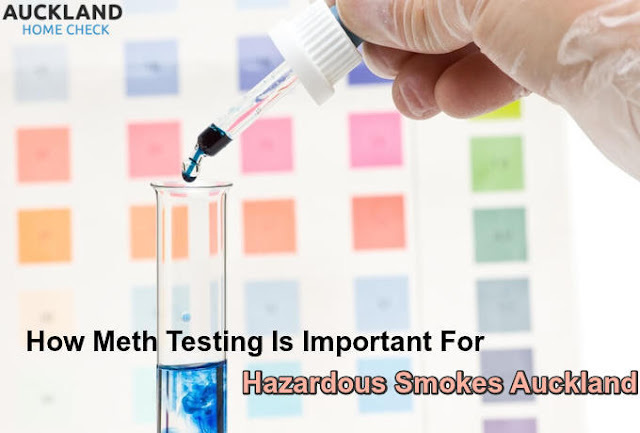 Those who have recently moved to their newly bought houses or those who are planning to purchase a new house must go for the meth testing Auckland as the increased usage of this drug made it a common and large number of people is smoking this deadly drug. There are many health issues like delusions paranoia cardiovascular problems and hallucinations etc. It is not necessary that your house is not contaminated if you don’t smoke meth as it might be possible that the previous owners were smoking and the residue left is damaging you slowly.